In Luna, Dean Wareham quipped his way through New York's arty-boho, high-society set over a cinematic soundscape of catchy melodies, guitar textures, and chugging Velvet Underground-inspired rock. The moon hangs over the Manhattan skyscrapers, the World Trade Center talks to the Empire State, guitar melodies rush by like taxicabs, the drums rumble below like the subway, something naughty is happening in a bar booth, and a passerby mumbles something under his breath: a quip, a seduction, a mad observation, a hope. Such was life in a Luna song as Dean Wareham and his rock band created a kind of imaginary, idealized Manhattan of the mind, one that was at once sophisticated and simple, uptown and downtown, snazzy and punky, lonely and full of people, glamorous and sleazy. Luna broke up in 2005, so these two new releases -- a best-of collection and a digital-only release of songs that Luna covered -- serve as a kind of summing-up of a band that never hit it big, but attracted a consistent popularity just below the radar of mainstream success. The music never possessed the oversized ego or effrontery of grunge. Neither was it jangly or rootsy enough for the Americana crowd. Instead, taking off from the Velvet Underground, whom Luna opened for on a European reunion tour in the early '90s, the band occupied a kind of ethereal strata of rock with a self-consciousness to it. Indie rock that wasn't hung up on indie cred, but wasn't about to record with the Matrix. Television for the Internet Age. Neither The Best of Luna nor Lunafied feature songs by chronological release date, which raises the question: what story do these new orderings of selected songs tell? 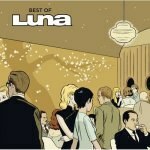 There is a cinematic quality to Luna's music that emerges on these albums. All those moody guitar textures and hummable melodies layered over simple, folksy chord structures sound like celluloid clicking through a projector. In fact, Luna's oeuvre could be heard as a companion to a whole set of films about the preppie art set of Manhattan. They sing the song of the penthouse above the open road. Play this music alongside your Whit Stillman, Noah Buambach, and maybe also your Sophia Coppola films. Keep your Collector's Edition Midnight Cowboy and The Graduate DVDs close by too, while you're at it. In the Luna movie, we see the world through a character's eyes -- our noir Dean Wareham. He's young, arty, bohemian, well-dressed, and moves in fancy circles, but maintains a cool distance from those around him. His life is lived in the tiny, tiny hours between the evening and the dawn. He's read his Paul Auster, has a vintage tube amplifier with blinking lights, and there's a space-age-bachelor-pad lounge chair in the corner of his loft. He knows the words to every Serge Gainsbourg song, and has a way-cool punk rock record collection. They're selling all his heroes, but he's heard it all before. Our leading man is blinded by love dust. He's out all night chasing girlies, he's late to work, and he goes home early. He paints your face on a twenty dollar bill, but it isn't legal tender and he thinks about you still. Then, when he sees you, he had to get drunk just to look at your face. But, later, he tells us that actually he's bad with faces, and worse with names. What all this adds up to is that our protagonist loves to play games of sexual conquest, coy flirtation, and cool remoteness. He wants to reap the bitter consequences, the droll perspectives, and the sublime melancholia of relationships gone wrong in the big city. The camera in this Luna film loves to focus on women, to catch them gazing out the window at the lights as they stir the olives in their martini glasses. They are well-dressed too, like our hero, and interesting looking, with good haircuts and funky retro skirts. Their eyes are deep and their makeup is just right and there is something mysterious about them. They could be actresses, writers, gallery owners, musicians, artists, publicists, trust-funders, young socialites. It doesn't really matter. Our protagonist is bewitched by them. He stares at their reflection in a puddle at his feet. He wants to plug them in, send them a pentagram, and feed them diasapam. "Please excuse my eyes, please excuse my hands, please excuse my eyes, put me in my place," he tells one woman from his past. "I'll wear a stylin' moustache, you'll wear a frozen smile," he tells another woman he's just met. She may only be able to see him again for twenty-three minutes in Brussels, but she -- and we -- will always tell him how much we miss him. If the Best of album is the feature film here, then the Lunafied digital-only release are the outtakes: Wareham's nasal voice and his band's layers of guitar, bass, and drums are the perfect vessel for transforming every song into something new. These are more than just covers, they are incorporations of old songs into a new life. They are the making of a usable musical past from lost singles and b-sides. Old music finds new meaning. As a critic once wrote about listening to Yo La Tengo's cover album, Fakebook, you can hear Wareham singing his record collection, which includes everything from the aforementioned Gainsbourg and "Everybody's Talkin'" Midnight Cowboy cover to Jonathan Richman, Beat Happening, Wire, Dream Syndicate, David Byrne, and Donovan. Together, these two albums offer an overview -- the film festival retrospective -- of Luna. This was a band that turned life into a glamorous movie and made us remember that a certain cinematic Manhattan of the mind -- with its buzz and groove, its enchanting women and its intriguing men; its droll humor and burning intensity; its damned sheer coolness -- can come into glorious focus under a million, a billion, a trillion stars. Roll the credits.